Dutch painter. He came from a wealthy patrician family in Haarlem and spent some time in Italy, where he met Cavaliere d Arpino. In 1610 van Dijck became a member of the Haarlem Guild of St Luke and in 1637 was elected deacon; he presented the Guild with a life-size cast bust of himself by Michelangelo. 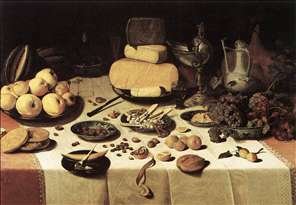 He specialized particularly in kitchen and fruit still-lifes. 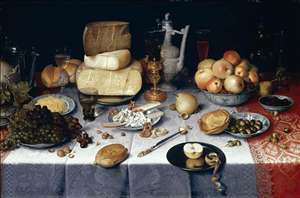 There is an affinity between his motifs and those of Nicolaes Gillis and Floris van Schooten. 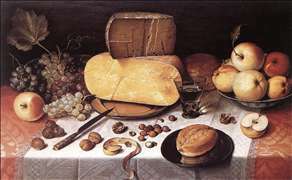 He enjoyed considerable fame during his lifetime and, with his Haarlem contemporaries Nicolaes Gillis, Floris van Schooten and Roelof Koets (15921655), was one of the earliest Dutch still-life painters. 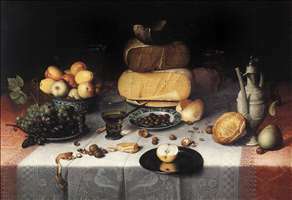 See more details about "Still-Life with Cheeses"
See more details about "Laid Table"
See more details about "Still-Life with Fruit, Nuts and Cheese"